If the soy beans are warm when you make this, the puree will be ready to use. If you make it in advance, reheat it in a small skillet or the microwave. Process all the ingredients in a food processor until smooth. Making the dish: Season both sides of the scallops with salt and pepper. Heat oil in a large non-stick skillet until very hot, but not smoking. 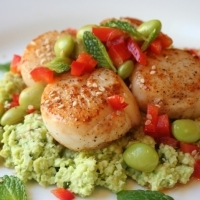 Cook the scallops until golden brown, about 1-2 minutes per side. Don't over cook! This sounds like a wonderful recipe and I cannot wait to give it a go! I've been looking for a recipe incorporating edamame and seafood... thank you very much! Five chopsticks from me!